It’s back! The 2nd Annual Food & Wine Festival at National Harbor. This fun-filled event takes place June 6th and 7th at the new and exciting upscale waterfront attraction right over the Woodrow Wilson Bridge. For my local 'Virginia Wine Lovers' who have not visited, National Harbor boasts top rated hotels, fine dining establishments, luxury shopping, and many other entertaining and relaxing options – not to mention beautiful views of the Potomac. I attended the festival last year, and they really did a wonderful job. It was the very first festival at National Harbor and it could not have been better organized. It was a weekend of sensory delight and adventure that offered great local foods from some of the areas top chefs, as well as wines to taste from all over our great globe, including excellent local flavor from Virginia and Maryland. There was also cooking demonstrations, wine seminars, and much more! I had a great time attending a blind tasting and a food and wine pairing seminar last year and some of the cooking demos too. Also, for the beer lovers, there was a beer bar; there was even a few spirit stands for the more adventurous. 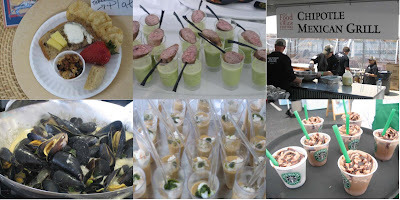 One area that this festival really shined was the food – unlike some food and wine events I have attended, this festival really delivered on the quality of the foods offered. Everything was so fresh, so yummy, and, so local! Click here for ticket information and additional details. National Harbor is the place to be for foodies and wine lovers alike on June 6th and 7th. Jump in the car or even catch a water taxi from Old Town Alexandria and make your way to National Harbor to eat, drink and be merry – it is going to be fun! After the festival, you can check out the mechanical bull over at the Cadillac Ranch or sing along to some catchy tunes at the dueling piano bar, Bobby McKey's. Or better yet, find a spot and enjoy the beautiful views with a glass of wine. Stay tuned friends ... more to come !! !